In December we set off for Gaza again. Over the summer of 2009 our director was offered a rôle co-ordinating what would become “Viva Palestina 3″, actually the second convoy run under the Viva Palestina banner from the UK. (Viva Palestina 2 being from the USA.) 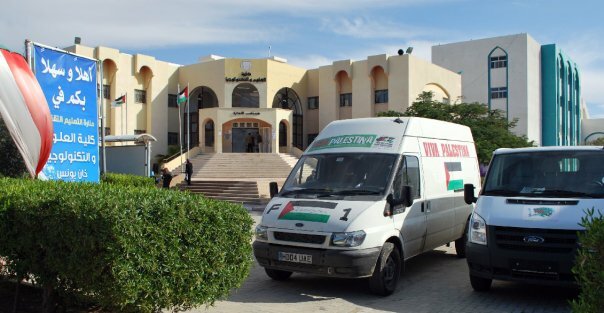 Although there were concerns about the increasingly political nature of that organisation, its achievement in supporting the victims of the fighting in Gaza was undeniable (see our write-up of the spring 2009 convoy). We were proud to be able to help in that regard. This time the convoy travelled by a more familiar route — as far as Greece, it might have been a trip to Kosova! We then crossed Turkey, Syria, and Jordan, before crossing into Egypt. Spending Christmas in blazing sunshine by the Red Sea was a memorable experience for the volunteers! As before, the convoy was primarily carrying medical equipment (partly due to Egyptian customs rules) although educational materials like schoolbooks and stationery had been accommodated as well. 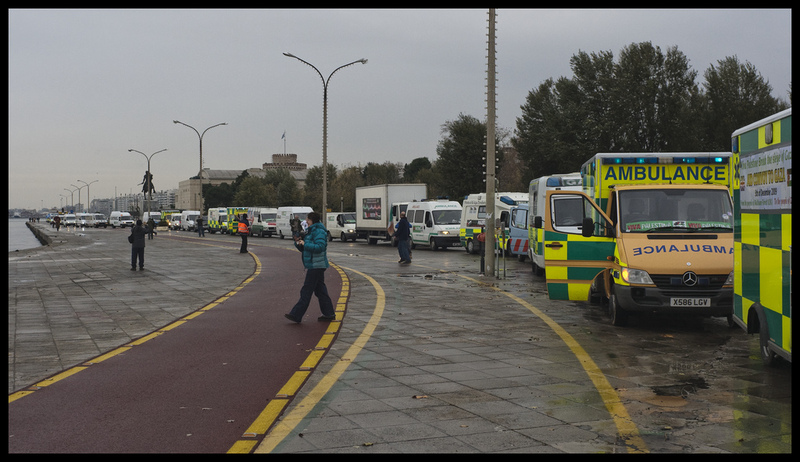 Many of the vehicles were fully-equipped ambulances, and others were minibuses with wheelchair lifts fitted; all of them were donated. The particular vehicle driven by our director, along with one further vehicle, were donated directly to a new contact we made thanks to one of the other volunteers; a relative of whose is the woman who is director of Khan Yunis College of science and technology (pictured). The college previously had no vehicles at all, which substantially hampered its operation! We hope to expand our relationship with the college in the future. 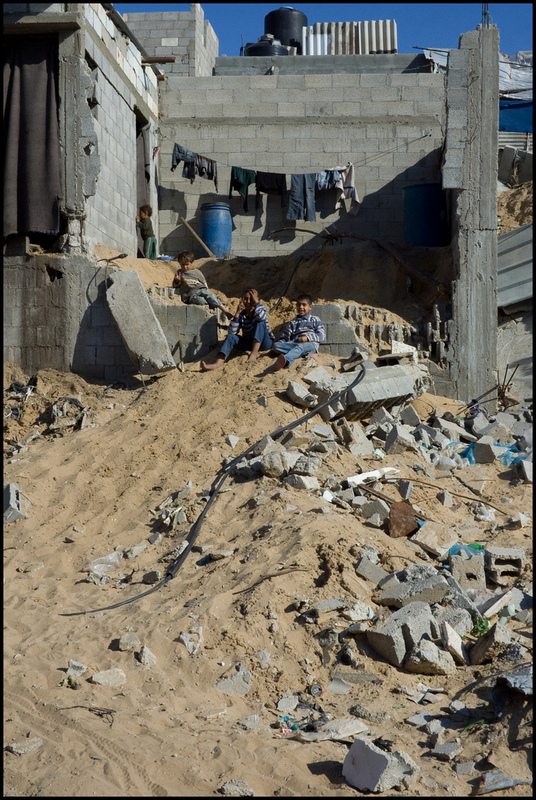 In other parts of Gaza we saw many people still living in appalling conditions. The need for ongoing support is great, and although this area is not “forgotten” in the same way as perhaps Albania or Chernobyl, our ability to be dynamic and flexible places us well to find ways to help. By this stage it had been decided to draw a line under our relationship with other organisations working in Gaza because of their political affiliations, but we resolved to continue working with the Gazan people themselves. Going back to the kinds of small-scale projects which worked so well in Kosova and Ukraine to bring about lasting partnerships, we are in touch with the local surfing club (yes, even in war-zones, people try to look after themselves with leisure activities!) and even a Gazan classic car collector — we hope at some stage to be able to arrange a classic car auction! These kinds of events are great for generating publicity (and of course the funding we need), and also lend themselves well to “twinning” projects to maintain support. If you are interested, please get in touch!